If you’ve given someone a ‘goat’ for their birthday or Christmas, you enjoy ethical shopping, or have taken part in the endurance race, "Trailwalker", then you probably know Oxfam Australia, a charity which has been fighting against poverty and injustice for over 60 years. What you may not know however, is that charities like Oxfam face similar issues to corporate businesses when it comes to being relevant for their consumers; an issue that was top of mind for Oxfam Australia CFO, Anthony Alexander. Mr Alexander invited a MBS student group to develop a ‘Business Model Canvas’ based on Alexander Ostwerwalder’s work, which is recognised as one of the pre-eminent business planning tools in the corporate and not-for-profit (NFP) sectors. “This included defining what our value proposition was, who our customers are, and identifying the different activities and resources we need internally to deliver value. It sounds very simple, but for an organisation with the breadth of services that Oxfam has, it was actually really challenging for the students,” he explained. For Oxfam, the development of a Business Model Canvas was a critical project because they currently face major external challenges such as declining government funding, competition from the private sector, and a changing NFP landscape. 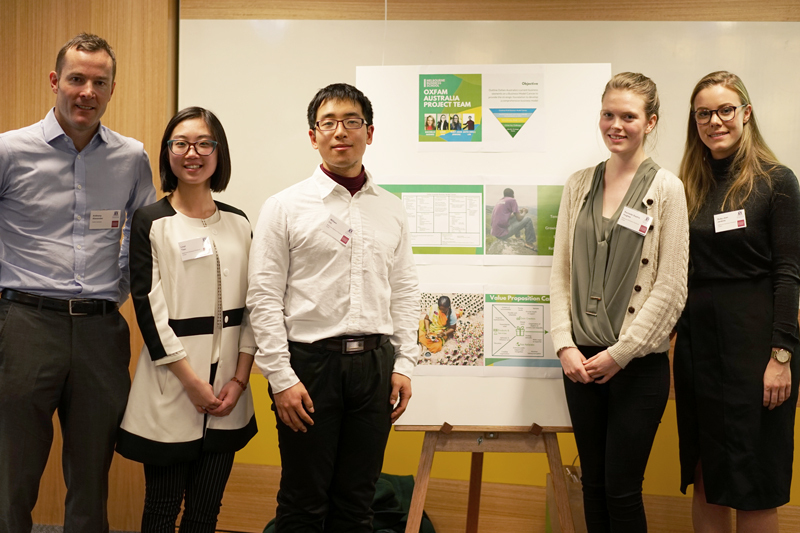 With this in mind, in just two weeks at Oxfam Australia, MBS students Rachelle Hughes, Ruby-Jean Jenkins, William Lin and Linzi Tan taking the Melbourne Business Practicum (MBP) subject presented a paper that delivered a new, innovative focus for the organisation’s business model. During the early stages of the project, the team discovered that the 2020 business footprint (or canvas) would be very similar to the current one. Oxfam’s management team acknowledged this and decided that additional development of the strategies driving the organisation’s value proposition would be more meaningful for future success. “They wanted to really understand their customers and match them to the right Oxfam value proposition. While there was a big shift (in focus) mid-way through the practicum, this allowed us to concentrate our research and deliver strategies that would be beneficial to the company,” explained Hughes. The team split up into pairs to interview 12 key management staff and gain a better understanding of the organisation’s business model, including the challenges and strategic issues it faced. They learned that Oxfam’s dedication on fighting systemic poverty globally, was underpinned by four pillars – humanitarian aid, long-term projects, advocacy and retail - and that there were a broad range of operations, leading to multiple customer expectations that needed to be fulfilled. “The main focus became the importance of value propositions, which informed our first recommendation: refine and tailor Oxfam’s delivery of value to each of the varying customer segments,” said Jenkins. The team also recommended that Oxfam Australia may benefit from greater collaboration across the organisation’s numerous departments. Hughes explained that this idea came about as a result of the interview sessions which showed different business units within Oxfam Australia, identifying the same common issues or challenges in relation to demonstrating value to customers. Mr Alexander praised the team’s "admirable job" in conducting interviews, ability to facilitate a strategic workshop, and ultimately, the producing of a final report that provided solid, well-founded recommendations on the issues at hand. Tan also reflected on how the MBP has helped shaped her future plans. After the two weeks of immersive learning, the former banking and finance student is now setting her sights on management consultancy as a career. She feels more confident in her employability through the added learning the practicum has provided. Jenkins summarised the group’s thoughts about the difficulties charities face in staying relevant to the public, saying, "Oxfam is just one of many important charities out there, and by the end of our project, we were all really invested in their work. We feel that the key to their long-term success is consolidating the value they deliver to different stakeholders, so they can implement aid projects and fundraising activities more effective." The Melbourne Business Practicum is an elective subject in a number of MBS programs including our Master of Management suite. Find out about our Master of Management programs.